We have witnessed a marked rise in the amount of venture investment dollars over the last decade. Capital has become near-ubiquitous, it may seem. These capital inflows have had a number of effects, including inflating round pricing and increasing the amount of capital competing for access to tier 1 startups. As we continue to near the tail-end of the mobile technology cycle, we are seeing the near saturation of many business models and sectors. Capital is being pushed towards frontier technologies. Opportunities in new protocols and technologies such as blockchain, AR/MR, drones, autonomous vehicles and conversational interfaces are surfacing, with many VCs placing their chips as to which platform wave to ride next. Generally, we can classify venture funds as generalist, thematic, thesis-driven, or sector focused. From the early days of venture investing until relatively recently, firms were predominantly generalist with individual VCs within the firms sometimes specializing in specific aeas. But in the last decade, we’ve seen thesis and theme focused funds emerge, helping investors bring concision to their thoughts and sanity to their deal flow funnels. Thematically-driven firms include Foundry Group, DFJ, and my own firm, betaworks. Thesis-driven firms like USV and Bessemer are leading examples of how to correctly execute on these investing disciplines. 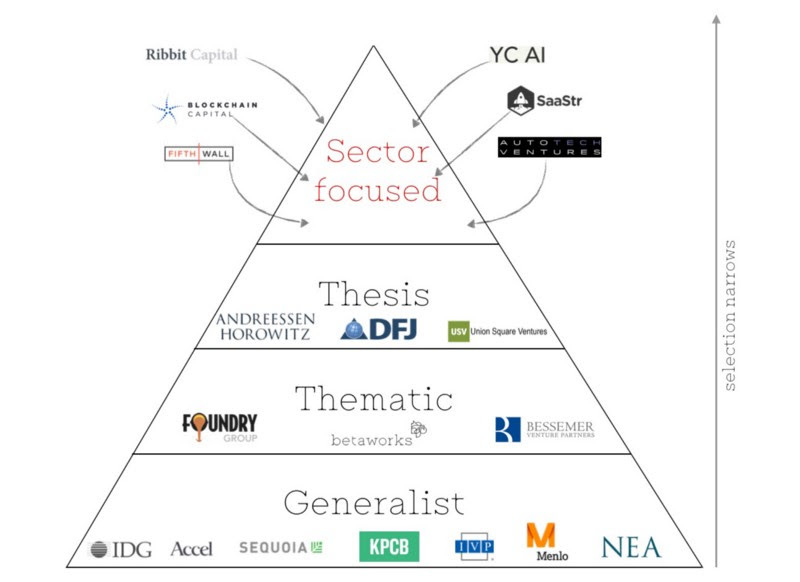 Knowledge is power: Deep sector-specific domain expertise allows VCs to attract higher quality deal flow, since founders expect added value (in the form of industry-specific contacts, parterships, etc) from these firms. Marketing: New VC firms raising assets need to be able to demonstrate to LPs that they have a relevant edge in sourcing companies versus established peers. Sector specialism and focus gives LPs comfort that investors will be disciplined and not profligate with their capital. It seems like the term “FOMO” was coined for venture investing. Investors often clamor for hype-cycle du jour startups. This (irrational) exuberance extends also to LPs , who increasingly seek novel technology investments and “momentum” industries and sectors. Venture returns are largely predicated on the power law of outliers. Outsized fund returns (more than 3x) generally consist of a few big winners in any one portfolio. With this in mind, an ability to access outliers is often important for early (seed/Series A) investors. This becomes increasingly important as fund size increases, with economics unlikely to allow for larger funds (over $150 million) to drive outsized returns whilst operating within small sector-specific concentrations. The reality is that few can predict which industries, technologies, or indeed companies are going to take off. Few saw the outliers of Google, Airbnb, and Uber; few were clamoring for more search engines post Yahoo, more accommodation booking sites, or black car chauffeur services. These mythical black swans are near impossible to predict in terms of sector, probability, size and impact — though arguably easier in terms of themes (mobile, social, network effects) or theses (“software eats everything”). As venture investors’ anti-portfolios demonstrate, successful technology outliers are non-obvious. Limiting one’s investment focus decreases the chances of hitting on one of these outliers; however, the tradeoff is a generally higher quality deal flow — sector allowing. As a sector-specific firm it’s conceivable that the space you play in only produces a number of breakout hits , and missing any one of these can be fatal. Ultimately, it will remain a challenge for insurgent investors to take scalps from tier 1 venture firms, although going sector-specific may give them the best chance of doing so. As the industry grows and the search for outliers becomes more competitive, expect to see more sector-specific venture firms looking to target narrow slices to attract deal flow and ultimately scale both capital and returns. Sam Cash is VP at New York-based startup studio Betaworks.